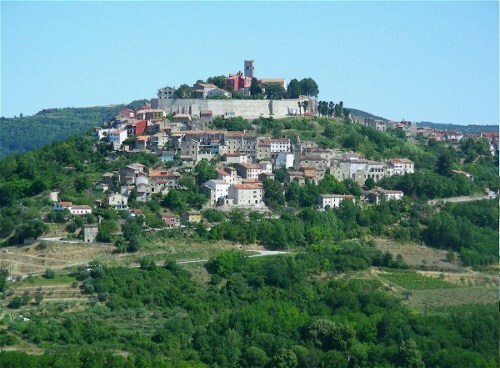 Situated some 27 km from Porec, lies the most famous and attractive hilltop medieval town of Motovun. Motovun is surrounded by vineyards from which the finest Istrian wines are produced and offers magnificent views over looking the Mirna River valley. The area is renowned for its famed underground mushrooms, which are known as truffles, with the worlds largest white truffle being found in the woods around Motovun. The town is a popular tourist destination and is famous for the Motuvun Film Festival which takes place for 5  6 days in late July every year. Also in close proximity is the Istrian thermal resort of Istarske Toplice, which is a thermal spa with curative water. In addition to the above, the entire area is sprinkled with an excellent array of local restaurants (konobas). Motovun and the surrounding area could best be described as offering a combination of nature, culture and peace.